valkrinos for arranging the room. Hisuitsume for being my partner and assistant during the convention. Andrew’s Progress on Cool Stuff and Cosplay and for feeding me. BARTBoy for making sure I did not need to be hospitalized. 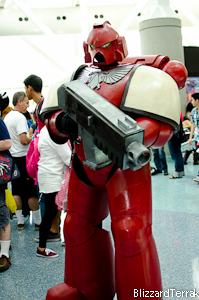 WARNING: The following is a long commentary on cosplayers and my experiences at Anime Expo. While these are not intended to cause harm to either group, it is a personal account of what happened to me during AX 2013, and I had some negative experiences. I wrote my previous post about Anime Expo because I wanted to give a good reason why, despite all the good things that happened to me during AX, I will not be returning for the foreseeable future. Many of my reasons are not the fault of Anime Expo but rather are the result of circumstances that reoccur every time I attended the convention. However, the cost/benefit ratio of attending is no longer high enough to be worthwhile. My first AX was in 2011 during “Mikuopolis.” That year saw the biggest concentration of Vocaloid art and cosplay I had ever seen thanks to the holographic Vocaloid concert. As some of you know, Vocaloid is not a series I prefer shooting because the characters don’t have any character, and their aesthetics range from frilly dresses to brightly colored street clothes. Still, that year I had many photoshoots, around 13 total, in only two days. That convention allowed me to do a bright photoshoot during the night thanks to the Nokia Center’s brightly lit advertisements. 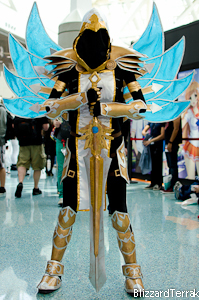 Despite having no badge, I had such a blast I went again during AX 2012. My second round at AX was an unmitigated disaster. That year, the X-Games were taking place at the exact same time in the exact same area. That event spilled into the Nokia Center and forced many AX attendees to circle all the way around adding approximately three blocks of walking. What’s worse, the maturity level of those who attended the X-Games was incredibly low. They were all stereotypical jocks: boys who think crass sexual innuendo is a valid method to talking to women and that it’s okay to call women sluts if they don’t kiss their feet. Those of you who read my post-AX 2012 report probably remember that four drunks jumped me after escorting a cosplayer back to her hotel. I was lucky that I only got a few bruises and a damaged light stand. This was also the first convention where about half my photoshoots cancelled on me. Most of them never told me what happened till after the convention, and most the ones who did only did so because I contacted them first. I said back then that I would not go to AX next time. So Why Did I Come Back For 2013? I talked to people and they convinced me that many of the problems I had during the convention were due to the X-Games. The longer walk tired out many photographers, particularly those who had more layers of fabric and especially those who wore high heels. And having jocks with an over-inflated opinion of themselves insulting cosplayers definitely ruined the experience for many people. However, in the end, it was the response from my friends that brought me back; lots of them wanted me to come to the convention to get a shoot. Many people can only pick a few California conventions to go to, so Anime Expo might be their one chance each year to see certain friends, including me. I was touched. So despite my logical side reminding me of the SNAFUs of 2012, I booked a flight and arranged for a badge and hotel room close to the convention. Hell, this time I would be staying all four days and I would even be cosplaying for a few hours. That should have given me a full con experience. Drama started on day one, Thursday, with my flight and my costume. They were minor issues and despite them, the day actually looked very promising. The same thing happened on day two, Friday with a few minor hiccups in shoot times and with only two cancelled shoots that day. However, by then the bag checks, lack of AC at the South Hall, and the fact that many places both on and off the convention grounds were forbidding photography started to wear on me. Still, two days ended on a positive note, so I could not wait for the big day. The SSDD part came on day three, Saturday. I was supposed to have four shoots in the morning till noon, and even managed to squeeze in an extra shoot. The extra shoot didn’t happen till later in the day and the cosplayer contacted me about the delay. The real problems centered on the other shoots that morning. Three of them were no-shows and I was not contacted by any of them with any sort of ETA or a request the cancel the shoot. I called, texted, and messaged them before and during the time we were supposed to meet. This was not the result of poor planning — we had clearly defined where we would meet and how to contact each other. Instead of eating breakfast, all I ate was static. The final straw came with the last cosplayer I had arranged to shoot that morning. I called her and she told me she would be about fifteen minutes late. I thought that was fine, and decided to replenish my supply of water. When I got back, she had just arrived and waved to me, but was then mobbed by two videographers. That was still fine, so I started setting up the equipment I had been carrying for 3.5 hours. When I turned around, she was leaving with another photographer. I called and texted to see if she would be coming back or not, but she never replied. In effect, I got dumped – traded up for someone else. All this happened right in front of me without consultation or even an apology. The worst part is, if I called any of these cosplayers out for acting unprofessionally, I’d probably be labeled a creepy photographer and a whiner. After three years of Anime Expo, I have finally learned a hard truth: “Photographers are Expendable”. Photographers aren’t even human beings in the eyes of many. A lot of people believe photographers don’t deserve the same curtsey that cosplayers always demand. That day, in anger, I sped back to the other side of the convention to take photos in the South Hall and carried all my gear on my back while I did it. I had forgotten to eat and drink just to make up for lost time, and got sick because of it. Despite this, I managed to keep my appointments for the rest of the day and on day four, Sunday. I flew back home sick, fatigued, and with only three memory cards filled. The best way I can describe my AX 2013 experience is to compare them to the Star Wars movies. I had seen photos from years before (A New Hope and Empire Strikes Back), and going to AX 2011 was flawed but still highly enjoyable (Return of the Jedi). 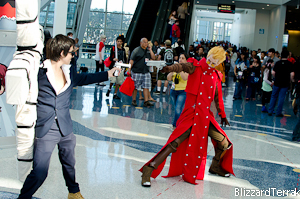 But then during AX 2012, I was dealt a bloody blow which left me not wanting to go back (Phantom Menace). But, I stuck with it one more time and while the experience did improve, so much of the enjoyment was gone, I couldn’t think of the convention as a special experience (Attack of the Clones and Revenge of the Sith). There are many things that are unique about Anime Expo that makes it friendly to younger audiences of Anime and Geek Culture as a whole, like the Star Wars prequels. However, there were just too many issues that ruined my enjoyment of the series (like a fan of the Original looking at the Prequel). In the end, this is not a convention meant for me, and that is probably why I feel less inclined about going back. ~ by BlizzardTerrak on July 17, 2013.